We’ve gone way beyond the traditional print-on-paper model to take print into completely new areas, such as bespoke interior design and short run packaging. We’re also using digital printing devices to produce a handful of copies of high quality affordable prints, instead of printing long runs that inevitably lead to much waste. Finally the bond between printing technologies and the work they produce is broken. Digital presses can print on virtually any surface including threedimensional objects and wood, so now it’s up to you to turn your ideas into printed reality. Over the coming months we will publish articles to help people new to digital printing to understand how it can help them express themselves. We’re calling this business Wild Format print, because that’s what it is: wild. There are no virtually constraints getting in the way of how you create printed versions of what your imagination invents. Digital printing technologies, new substrates, inks and toners create all kinds of exciting and unrestrained possibilities for creative expression. Your amazing journey of discovery into Wild Format digital printing technologies will help you enhance how you communicate. Whatever your interests from books to soft furnishings, the Wild Format series of articles can help you get the most out of your ideas and creativity. Whether its bespoke packages, custom fabric designs, signage, calendars, photobooks or celebratory posters, the opportunities for new forms of expression are endless. Digital technology creates unprecedented opportunities for sharing visual concepts in print, because it’s completely flexible. The technology can be configured for all sorts of output sizes, shapes and surfaces. It makes print universally accessible because the print process is no longer complicated or prohibitively expensive. Anyone, anywhere, can have their ideas printed quickly and conveniently on materials that range from paper and board to glass, plastic, ceramics, metal, wood and textiles. Print production is no longer just for the elite, it’s no longer costly or convoluted and confusing. Those days are far behind us, and today’s printing industry is yours to drive. You can take control. The HP Latex 3600 is a wide format device that you can use for printing wallcoverings. HP has a dedicated software package, HP WallArt Suite, to handle the production details. Print was once a messy, complex and highpriced business run by specialists, cloaked in mystery and magic. But today, thanks to digital technologies and advances in material science, this elite model is long since dead and buried. Print in any format is accessible and affordable, from singlecopy prints to many thousands, from black and white to more than half a million and more colours. The tools are available for you to create your own data files and get the results you expect straight from your desktop. Once you’ve got your files, photos for example, you can even order the print from your mobile phone. You can get a photobook of your favourite holiday or a special event within days. How cool is that? Thanks to sophisticated software and digital printing technologies, print production is no longer a black art. Production processes are behind the scenes, and the clever science is the stuff you don’t need to see or get involved in, because you don’t need to. The mechanics of print are solved in hardware and software innovations operating in tandem with powerful new imaging techniques. Today’s print production is slick, automated, affordable and readily accessible to all of us. Just as you don’t much care about how a shoe is made, you don’t need to know the grubby details of how print happens. As long as the shoe fits and does the job, that’s all that matters, and so it is with print. All you need to know is that you can get it,you can afford it and you can enjoy it. If you want a printed physical version of what’s in your head, you only need to care about who’s got the right equipment, how much that print service provider will charge you per copy or item and how you do what you have to do to do to make sure the production process is flawless. During this series we will explain what you need to know to create magical projects using digital printing technology. Most ofwhat gets printed is still printed on paper, but printing on paper is a small part of the digital printing universe. There are also exciting possibilities for printing on carton and board, on plastics and mesh, or canvas. You can use digital printing devices to print textiles such as polyesters, linen, cotton and even silk. If you fancy creating a new wallpaper, maybe an image from your favourite city, you can do it with digital printing. 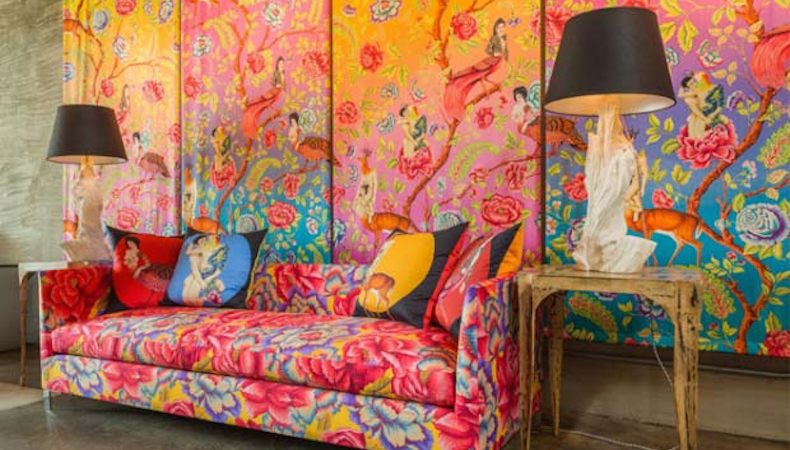 You can completely personalise your home using customised print, based on designs you create for your own wallcoverings and fabrics. You can take the idea even further and print your design direct to garments such as tee-shirts and aprons. You can even get your own designs printed onto ceramic tiles, glass and splash backs, so that your kitchen and bathrooms are totally personalised. You can advertise your business or an event by wrapping your car with event information printed onto adhesive plastic that can later be removed and replaced with new printed ideas. If you want a variation on a fashion concept printed on clothes, you can create patterns that change slightly with each piece of print so no two pieces are the same. And it can all happen automatically if you do it right. This, plus so much more, is all possible because of two technologies: onlinecommunications and digital printing. Just as you can access Instagram or WhatsApp to share content, so you can share files with printing companies that specialise in all sorts of different production types. They have the technology to produce your work with drop-dead gorgeous results. Wild format technologies are applied in all sorts of printing businesses and creative project development is not just the preserve of big name brands. Everyone from managers working on demanding projects and tight deadlines for complex business messaging, to individuals who just fancy making something special, can producetheir ideas in print. It doesn’t matter how ambitious your demands, you can trust that there is a printing company out there who can help turn your concepts into reality across formats. You can, for instance, design your own ideas for a new floor or walls and get them printed up to five metres wide. If you need wider, you use more widths to create custom interiors or supersized banners and posters. If you want to print a handful of giant books for children to play with, you can do it using digital printing technologies and specialised finishing. You can create kitchen linens, tea cosies and pot holders, or even have your favourite washing-up brush printed with the latest family photo. It can be as wild and crazy as you like, and take you wherever your imagination goes. All of this is possible and painless if you understand some basics. Everything we’ve mentioned here is real, because digital printing systems are optimised to suit different materials and print sizes. You do need to be aware of how to match available technologies to your project requirements to get the best results. You also need to know how to prepare your data so that you get the best print quality. This is not hard and explaining it is what the Wild Format series of articles is all about. Getting it right starts with your ideas and how you want your creations produced whether it’s text, line art, illustrations, photographs or any other form of content. This is the beginning of going wild with digital printing.